Austin, TX (May 1, 2017) – Artisanal Imports announces its Draft Tower Program in partnership with Chicago-based Leaders Beverage www.leadersbeverage.com for its brands including Kwak, La Trappe, Tripel Karmeliet, St-Feuillien and Veltins. The duo consults with retailers and distributors to place high-quality, eye-catching placements in bars, pubs and retail shops nationwide. Draft towers serve to attract customers and build brand loyalty, all while providing distinguished character to the establishment courtesy of some of the most recognized European breweries. Beer brands and their towers are strategically selected to maximize both sales and name recognition while remaining compliant with applicable laws, which vary from state to state. 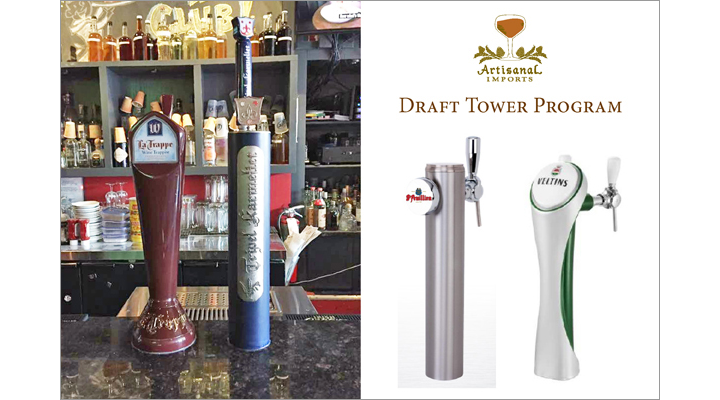 The draft towers are crafted with durable, easy to use materials by the highly-vetted team of draft service and beverage professionals at Leaders Beverage. “Because these towers live in bars all over the world they are produced with no interior workings, which allows us to build the interior of towers installed in the US to the exact specifications required for each individual venue,” says Drew Larson, CEO-Leaders Beverage. Qualifying retailers such as Lindo Sabatini, Owner of Sabatini’s Pizza & Sabatini’s Bar & Bottleshop in Exeter, Pennsylvania www.sabatinis.com, utilize the Draft Tower Program to great success. For Artisanal Imports, Leaders Beverage and their retail partners, success is ensured through shared values of teamwork and unwavering attention to quality. Are you a distributor or retailer interested in joining the Artisanal Imports Draft Tower Program? Please contact Lanny Hoff with interest by phone +1 (612) 245-5433 or by email at lanny.hoff@artisanalimports.com. About Leaders Beverage: Leaders Beverage is a team of hands-on beverage professionals located in Chicago which specializes in clean, expert draft service and maintenance, beverage consulting, education and sales. Its team is comprised of Certified Cicerones®, certified sommeliers and certified spirit specialists who focus on education over sales, and true, lasting partnerships. Learn more about Leaders Beverage at www.leadersbeverage.com.